Here's a wonderful vegetarian version of the classic Greek dish Moussaka. This is just one of the great vegetarian recipes in our new cookbook, "Feel Good Food, Recipes from the Hudson Valley's Blue Mountain Bistro-to-Go". We're excited to share some of our favorite recipes from our new cookbook, Feel Good Food, with you in the weeks to come. This hearty, savory vegetarian casserole is a satisfying fall dish that will please your family and friends. If you have left-overs, it freezes and reheats well for a night when you just don't feel like cooking! Plan to make this dish at home? Snap a photo and share with us using the hashtag #FeelGoodFoodCookbook. Moussaka, usually associated with Greece, is also popular throughout the Balkans, Turkey, and the Middle East. In this preparation, the lentils and mushrooms take the place of meat. 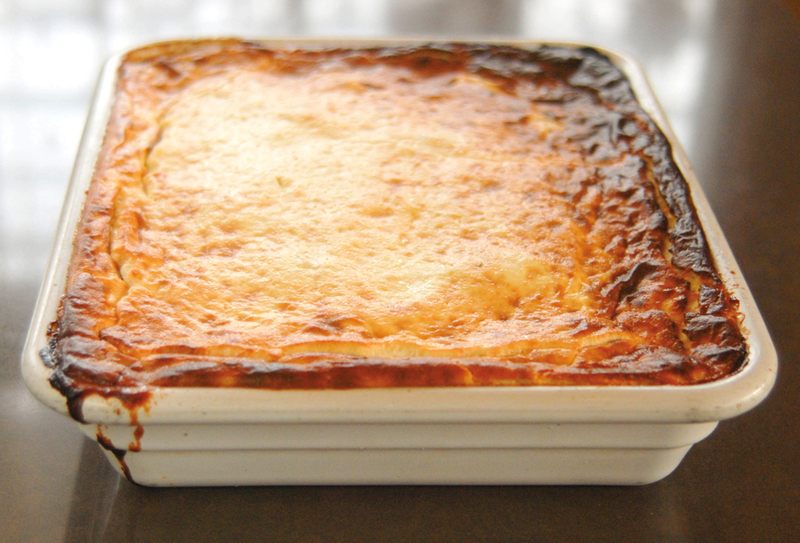 The usual way of preparing moussaka is to cook everything separately and layer it, lasagna-style, into a casserole dish. This easier method is just as tasty and looks fabulous once it’s covered with the béchamel sauce. Have fun making it and enjoy! Preheat oven to 375°F. Trim ends off eggplants and, with a peeler, peel off strips lengthwise. Cut into roughly 1/2"–3/4" cubes and place in a stainless bowl. Trim zucchini, cut cubes approximately the same size, and combine with eggplant. Toss with a couple tablespoons of salt, and set aside. Bring potatoes to a boil in salted water, cook 4–5 minutes, and drain immediately. Toss with a bit of olive oil, salt, and pepper in roasting pan and place in oven for 15 minutes, or until golden and tender. When beads of water appear on eggplant and zucchini, it’s ready to rinse in cold water, squeeze a bit and pat dry with paper towels. Toss with a bit of olive oil and roast 15–20 minutes on a baking sheet until soft. Set both aside until the sauce is prepared. To make the sauce, in a large pot over medium-high heat, combine olive oil, onion, celery, and carrots. Cook, stirring frequently, until vegetables are almost tender, 8–10 minutes. Add mushrooms and garlic, stirring well, then add oregano, allspice, and cinnamon, cooking for another 4–5 minutes. Add red wine, lentils, crushed tomatoes, and water. Bring to a boil, reduce heat to a simmer, and cook, uncovered, until lentils are tender, 20–25 minutes. If lentils have absorbed all the liquid, add a bit of water; the final result should be the consistency of marinara sauce. The potency of ground cinnamon and allspice can vary; add more if yours is old and faded. (The scent of these spices gives moussaka its character.) You are now ready to assemble the dish. Lightly oil a 4 qt deep casserole. Cover bottom with potato slices. Pour half the tomato-lentil sauce over potatoes and cover with roasted eggplant and zucchini. Top with feta and pecorino cheeses. For the topping, whisk together béchamel, egg, and yogurt. Pour over casserole, covering the top evenly. Place casserole on a baking sheet and bake 45–50 minutes, until top is golden brown and edges are bubbling. Let stand for at least 20 minutes before serving. My mother called this a white sauce, which indeed it is. The basic procedure and technique used to make it are fundamental building blocks for many other dishes. Recipes such as mac ’n’ cheese (pg 204), lasagna, and moussaka (pg 176) all utilize béchamel sauce. The ratio below will make a sauce of medium consistency. For a thicker sauce, increase the ratio of flour and butter to milk (known as a “roux”), and for a thinner sauce simply add more milk. Slowly melt butter in a medium saucepan and add flour all at once, stirring until smooth. Cook 2–3 minutes, until mixture just starts to turn a light golden color but do not let it brown. Add milk, a bit at a time, whisking constantly until all the milk is added. Add a good pinch salt and a few grates of nutmeg and keep whisking until bubbles start to appear. Reduce heat and simmer, stirring 2–3 more minutes. If you are using later, remove from heat, cover with plastic wrap, wax paper, or a few dots of butter, to prevent a skin from forming. Use the sauce within an hour of making it, or refrigerate for a longer period.